Gelsenkirchen - If Franck Ribery scores, FC Bayern München win. It is a theory which is becoming a proven fact, as for the 30th game in a row in which the Frenchman found the back of the net, the record title-holders collected all three points. Bayern may not be breaking records in the same manner they did last season, but the 2012/13 UEFA Best Player in Europe is now just three games away from clinching another personal Bundesliga best-mark as he chases down Franz Beckenbauer’s legendary 33-game streak of scoring in Bayern victories. In the 100th competitive encounter between FC Schalke 04 and FC Bayern, the Royal Blues suffered their biggest home defeat in 32 years. Having covered 11.65 kilometres and completed 40 sprints, Ribery played a big part in the 4-0 triumph as he grabbed his fourth goal in six appearances in all competitions. Following the encounter the wing wizard discussed the Bavarians’ impressive performance and his outstanding partner on the left flank. 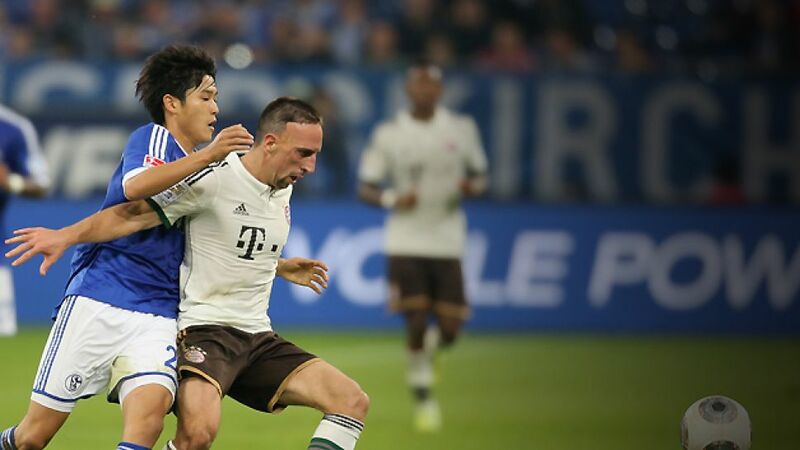 Question: Franck Ribery, congratulations on finding the net and a convincing win over Schalke. How much fun did you have today? Franck Ribery: Games like this are always a lot of fun. We won 4-0 and picked up three important points. The whole team were in exceptional form. We worked incredibly well together and played like champions. We were already on the right track against PFC CSKA Moscow in the UEFA Champions League. If we can maintain this kind of form it would be super. Question: You’ve got a big plaster on your leg. What happened? Ribery: I had a coming together with [Jefferson] Farfan. It hurts a little bit, but isn’t a big problem. Everything’s fine. Question: You won 2-0 against Hannover, 3-0 against Moscow and now 4-0 against Schalke. Where do you go from here? Ribery: We’re currently playing completely differently and much better compared to the beginning of the season. If we can continue performing like we did against Moscow and here against Schalke then we’re heading in the right direction. We’re playing with a lot of energy, working extremely well defensively and are still creating a lot of pressure in the final third. We took our chances really well today and scored two quick goals in succession. Playing against Schalke is always difficult and to win 4-0 is never easy. The fact we managed to do that is fantastic. Question: You were one goal short of moving above Borussia Dortmund in first place. How long will it take before you do? Ribery: It doesn’t matter to us what Dortmund and the other teams are doing. We’re only concentrating on ourselves. Of course we heard that Dortmund had drawn in Nürnberg earlier today. For that reason picking up three points against a big team like Schalke is all the more important. Question: How are you approaching the DFB Cup game against Hannover 96? Ribery: The win today has given us a lot of confidence going into the cup game against Hannover next week. We want to extend our seven-game winning streak in the cup. We’ve always got to win, win, win. Question: A word about David Alaba. who provided two assists today, having scored one and set-up one in midweek against Moscow. What’s it like playing with him on the left wing? Ribery: The lad is really special. He’s playing well and provided another two very good assists today. I’m really happy for David.